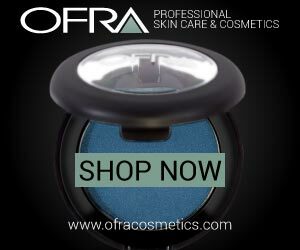 ← Makeup Tutorial/Fashionista Magazine: How to get Perfect Neon Pink lips! If there’s one thing I love in life it’s a good, in your face, babooming Duochrome. It’s just such a magical experience. You see one color one time, a completely different color the other. 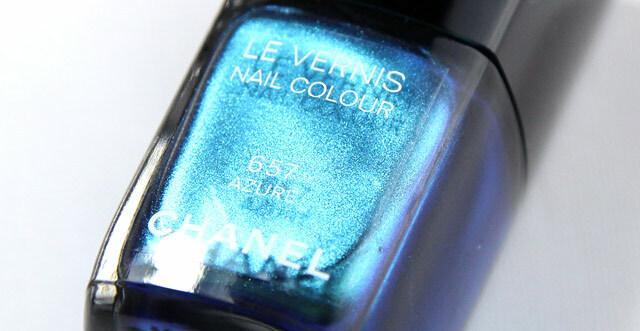 When it comes to duochromes in nail polishes, Chanel is the Queen of the realm. 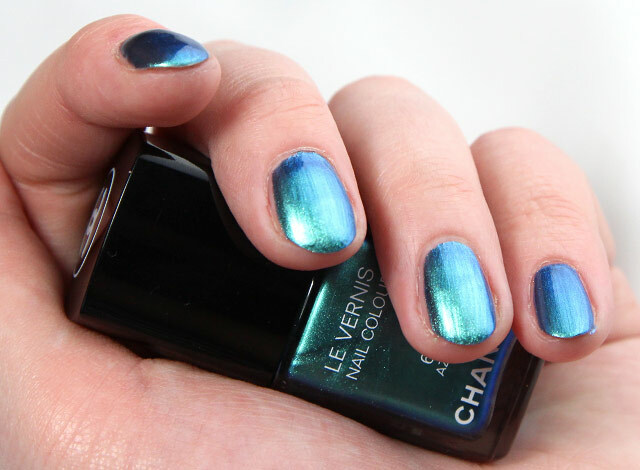 With Chanel’s new L’Été Papillon collection, they launched a stunning new duochrome called “Azuré”.. So with all languages I’m not a star at, I decided to do some research! (and with research you all should know I only did some Google Translating.) 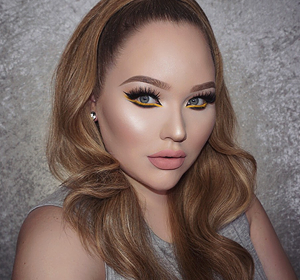 This collection is inspired by butterflies as this collection’s name literally translates to “Summer Butterfly”. 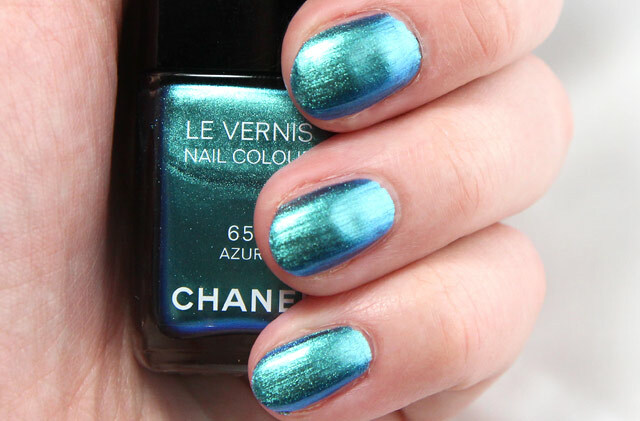 Admit it, all you non French knowers also thought Azuré had something to do with a beach..
Chanel decided to transform this beautiful butterfly into a gorgeous duochrome nail polish. Gosh, I love it when brands turn things into a duochrome goodness. “Azuré” is an absolute pleasure to look at for hours. I’d describe “Azuré” as a mesmerizing bright blue with a chrome-like mint/teal duochrome finish. It’s unique, modern and perfect for hot summer days. ↑ Indoor picture, no flash or whatsoever. “Azuré” might be a stunning color but applying it is another story. It’s a bit runny at times which can cause cuticle flooding, which is one of my biggest pet peeves ever, when it comes to nail polishes. Also be extra careful with your brush strokes as this polish can end up being quite streaky. What “Azuré” does shine in is it’s opaqueness. I only needed two coats for all my nails to get duochrome-y perfect. 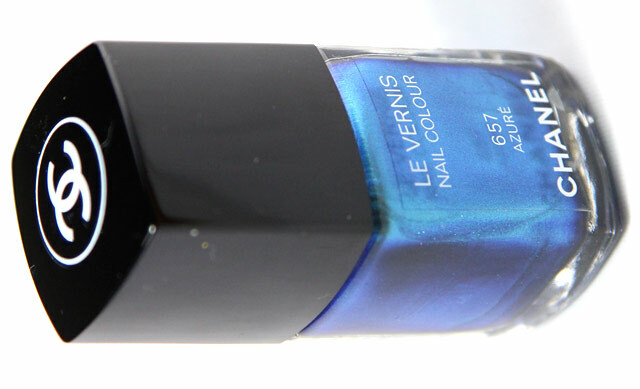 This entry was posted in Nail Polish, Reviews, Swatches. Bookmark the permalink. I adore this colour! I just wish it didn’t cost $40 here in Australia! This color is SO beautiful. I just wish it wasn’t so expensive :( I actually JUST did a post showing a very close dupe for this if anyone is interested! 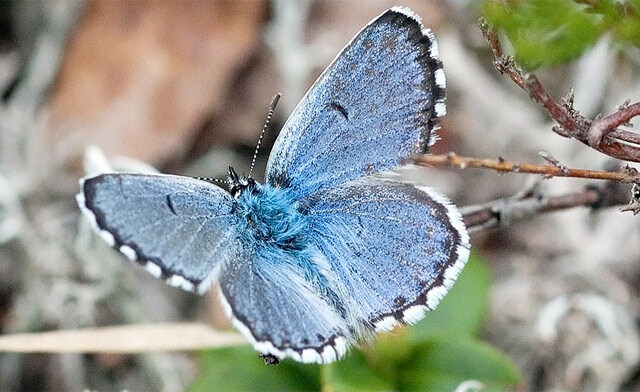 suuuuper mooie kleur! wel een beetje duur… maar ja het is dan ook chanel. Oh my gosh this color is stunning! Love this colour! Looks like the same colour as Sally Hansen Lustre Shine in Scarab #007 in the bottle but not sure if its a dupe. It is a beautifull colour! I may have found a dupe for Azuré. 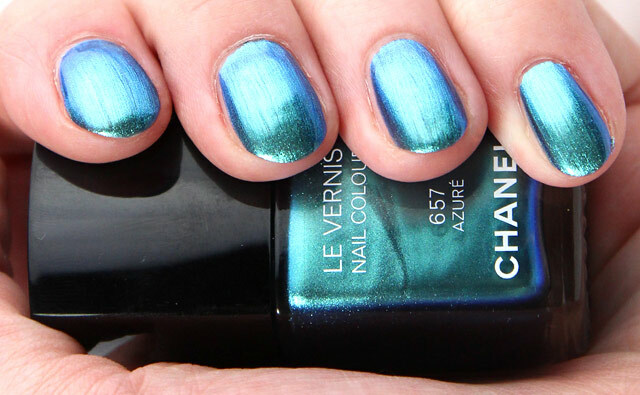 I have a GOSH nailpolish in Ocean that seems to be a good dupe voor this colour, but I don’t have the chanel one, so I can’t compare the two. 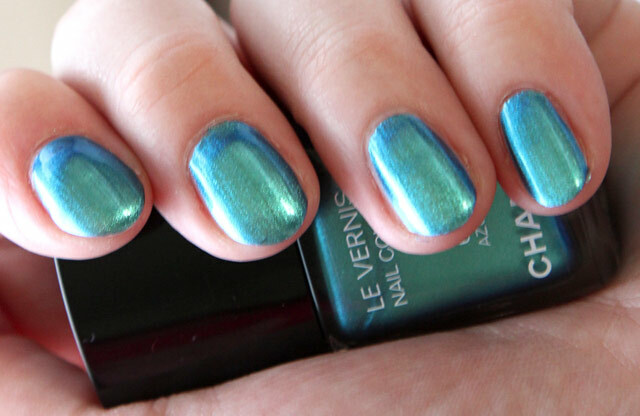 Ocean by GOSH costs only €7,49 and it needs 2 coats. Dupe bij h&m te koop! I am sorry but no dupe can top this polish. I have it and I love it. I can stare at it for hours. 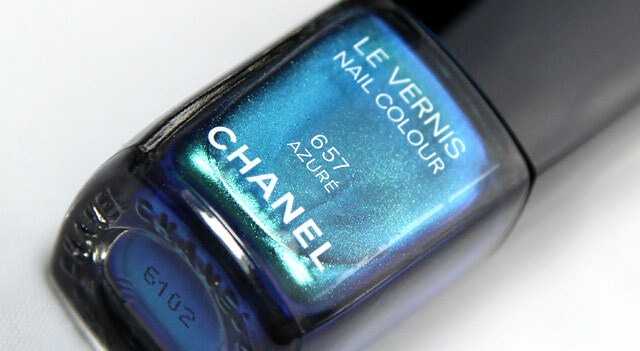 It is one of the most beautiful nail polish colours I have seen in my life! It is an ocean on nails. When I look at it I am in summer paradise.